There was once a self storage facility in San Antoniothat wanted to let its customers know that they were greatly appreciated. The managers of the facility thought of all sorts of ways do this, but nothing seemed quite right. They wanted to give their customers something that would leave them with a smile all day long, and communicate how sweet it was to have their business. Then, a lightning bolt of glazed genius hit manager Chris Pruitt. He didn’t stop there though. Chris decided that no ordinary donut would do. So he would offer not only a glazed dozen, but also a variety of donuts of different glaze types, sprinkles, fillings and sizes. Chris was on a roll when suddenly, another idea was injected into his mind like a jelly filled Krafne, “I love our customers so much, we should have donuts for not just one day, but TWO!” He beamed. 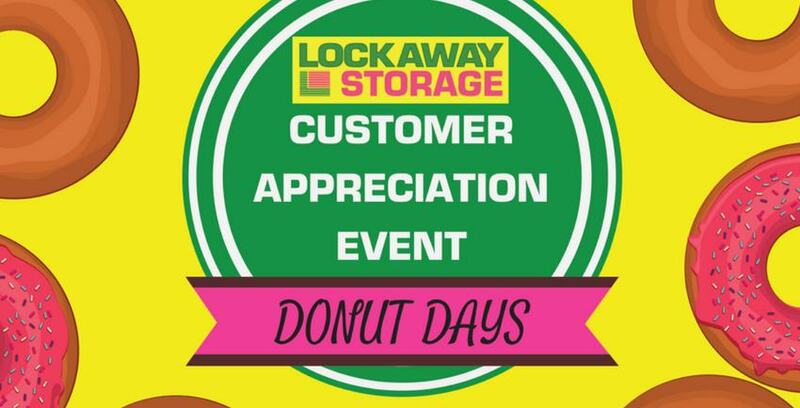 With much delight, he then set the date for the customer appreciation event to happen to during office hours, August 1st and 2nd, and all the facility rejoiced in anticipation of the exciting event! While the story above may be a slightly dramaticized version of actual events, you should still be excited for a day that is meant to celebrate you, the customer! When we asked Chris why he was passionate about going above and beyond to show them his appreciation his answer was equally passionate. There you have it! Do you need any more reason to feel the love and grab a donut on August 1st and 2nd? We didn’t think so. Make it a great day and stop by for a donut, or even just to say hi to Chris and the team. We wouldn’t want all that “glazed genius” to go to waste!